It turned out not as comforting as the non-vegetarian risotto, but I still couldn’t stop eating it. Needing an excuse to use the Better Than Bouillon vegetable base purchased a couple of months ago, I decided to try a vegetarian risotto. Along the journey, came the thought to make this risotto the traditional way. 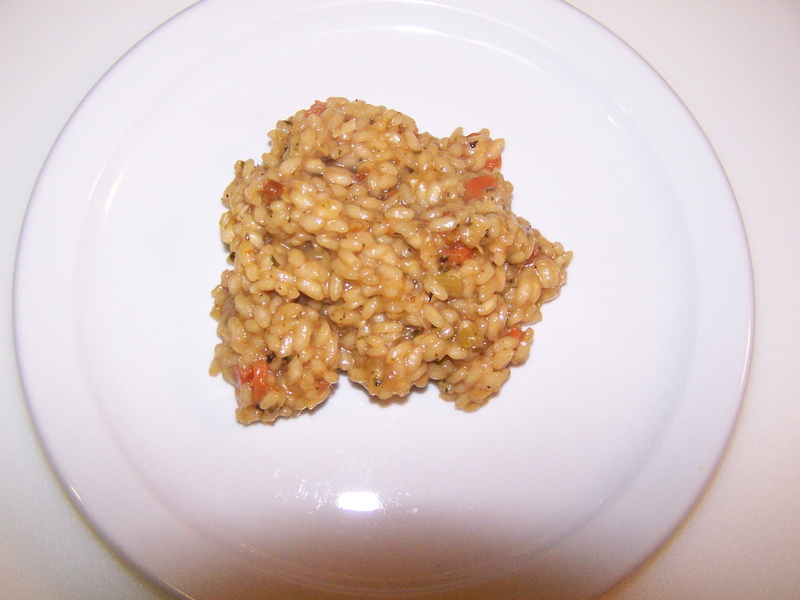 Traditionally, risotto is cooked by adding small amounts of hot liquid to the risotto rice while constantly stirring. Although this recipe has different ingredients, the simple basic risotto method seemed to give more consistent results. There’s no real substitute for chicken broth, both for flavor and texture. 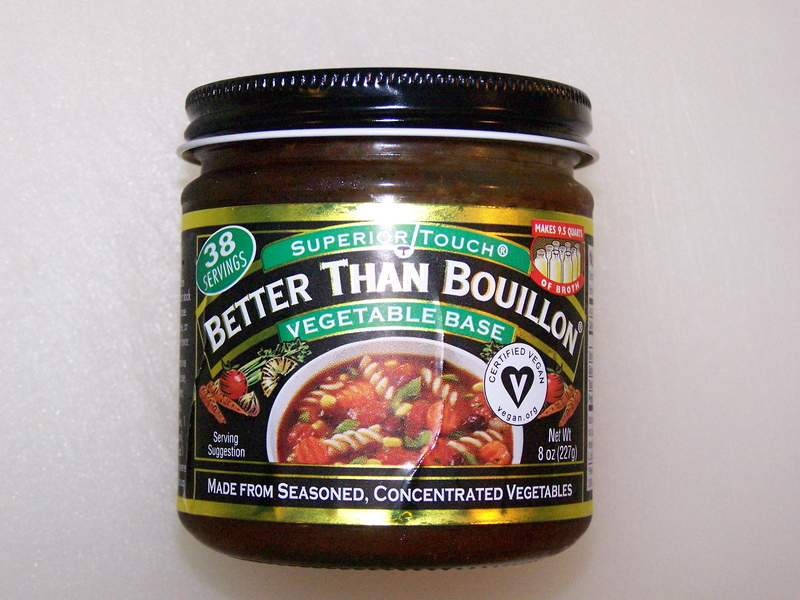 While the Better Than Bouillon vegetable base used here has a lot of flavor, it doesn’t make chicken broth (if for no other reason than it’s vegetable base). Into the new recipe went some extra garlic and olive oil; basil, oregano, parsley, carrots, celery and crushed red peppers. The result is not the same as our previous risotto, but the result is equally satisfying in its own way. Using the traditional risotto cooking method, it was much more difficult to get all the rice cooked to the same doneness. This raises the challenge to try these ingredients with the simple risotto method next. And one last difference, the chicken broth risotto looks better. While good, the vegetable base adds a dark color to the rice. Stir the vegetable base and sugar into 4 cups of hot water in a small pan. Continue to keep the vegetable broth hot, over low heat. It’s important to add hot broth to the cooking rice in the next steps. 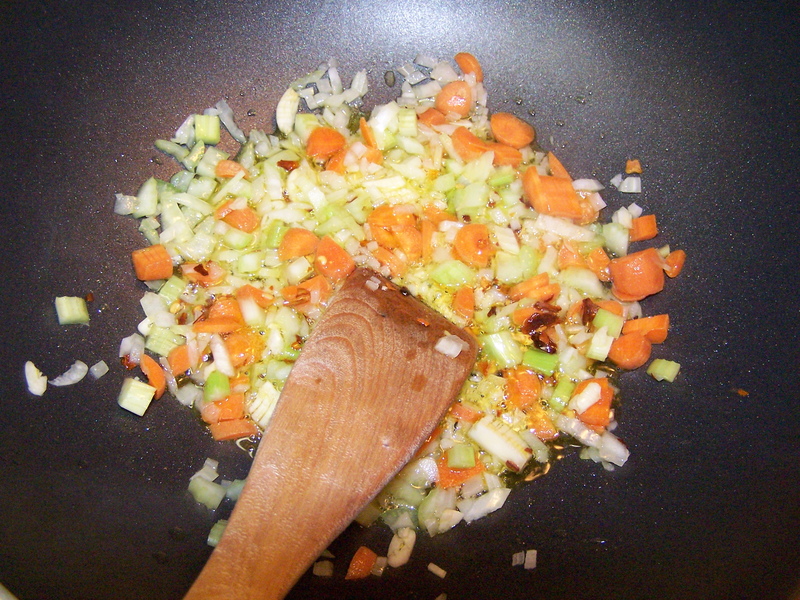 In a large frying pan or wok or wok-type frying pan (used here) saute over medium heat the; onion, garlic, carrots, celery, crushed red peppers, basil, oregano, parsley for about 3 minutes. Add the rice and continue to saute for about 3 more minutes. Stir to coat the rice with the oil. During this step we’re going to cook the rice in the open pan. The game is to keep the liquid and rice simmering throughout the process until the rice is done. 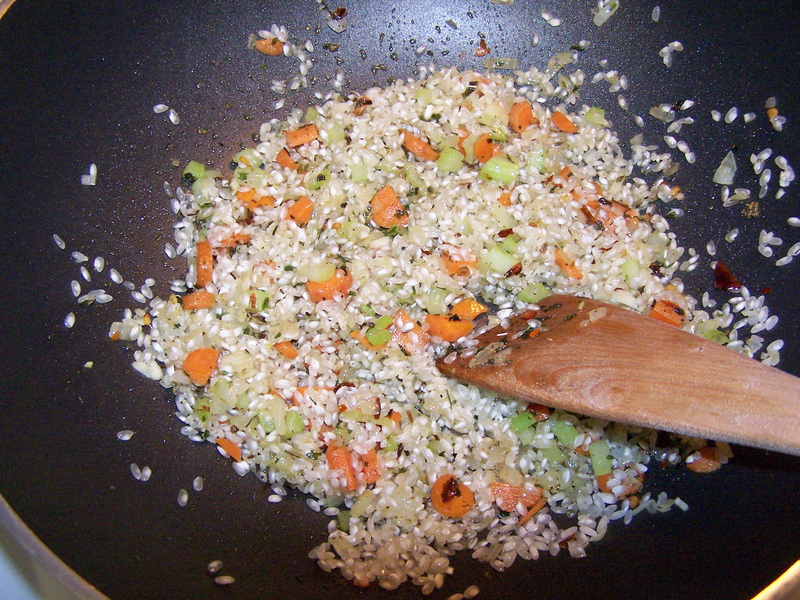 After the rice is sautéed for about 3 minutes, add a ladle full of the hot vegetable broth to the frying pan. It should sizzle. If it doesn’t, raise the heat. Make sure the rice and liquid are simmering. Stir the vegetable broth and rice until all the broth is about absorbed by the rice. Add another ladle of broth. It should sizzle again. If not, you may need to raise the heat. Continue to simmer and stir until the broth is mostly absorbed by the rice again. Add more broth, stir until mostly absorbed, and repeat, and repeat and repeat. At about 20 minutes start tasting a grain of rice to check for doneness. The rice should not be hard. The rice should not be mushy. You’ll know when the rice is right. Continue to cook , adding broth as needed, and sample the rice every couple of minutes until the rice is done. By the time the rice is done all the broth should just about be gone. If all the broth is gone and you feel the rice needs additional cooking; add some water instead of broth. My rice took about 25 minutes before I gave up and called it done. 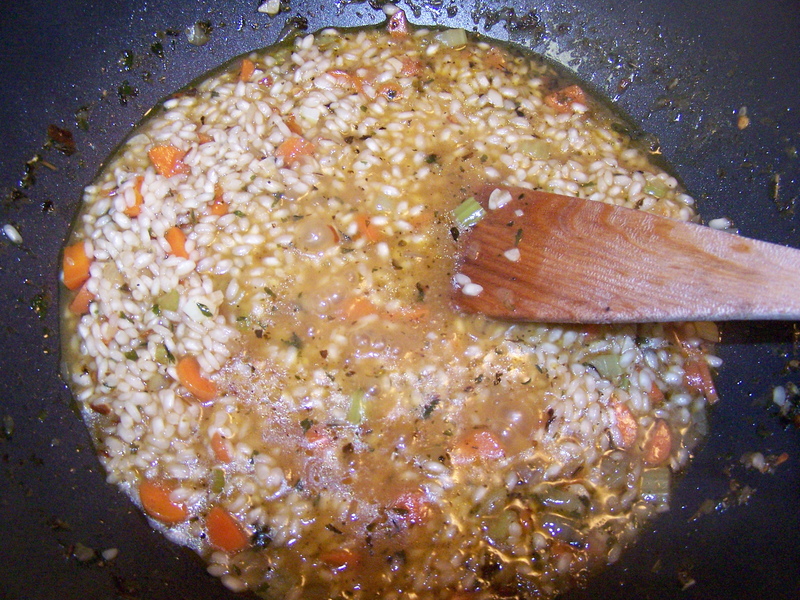 When the rice is done, remove from the heat, stir in about two tablespoons of olive oil to finish off the risotto. How does this compare to the chicken broth risotto? Not surprising, it’s totally different. The extra ingredients here make up for some of the flavor lost by not using chicken broth and parmesan cheese. The crushed red pepper helps add some of that stomach warming feeling. Either recipe is going to restoke the engines after a day of working outside, especially on a cold day. While it’s hard to stop eating the chicken broth risotto because it, well, feels so good, it’s just as hard to stop eating this vegetarian risotto because it, well, tastes so good. Tastes, feels? Feels, tastes? They’re both good in their own ways. And either feel or taste is not far from the other’s. This entry was posted on 02/20/2011 at 12:50 and is filed under Recipes, Recipes, food, cooking and related items, Vegetarian. You can follow any responses to this entry through the RSS 2.0 feed. You can leave a response, or trackback from your own site.